This volume brings together articles (including two hitherto unpublished pieces) that Susan Reynolds has written since the publication of her Fiefs and Vassals (1994). There she argued that the concepts of the fief and of vassalage, as generally understood by historians of medieval Europe, were constructed by post-medieval historians from the works of medieval academic lawyers and the writers of medieval epics and romances. 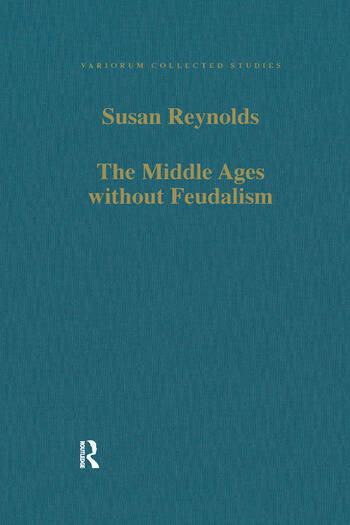 Six of the essays reprinted here continue her argument that feudalism is unhelpful to understanding medieval society, while eight more discuss other aspects of medieval society, law, and politics which she argues provide a better insight into the history of western Europe in the Middle Ages. Three range outside the Middle Ages and western Europe in considering the idea of the nation, the idea of empire, and the problem of finding a consistent and comprehensible vocabulary for comparative and interdisciplinary history. Contents: Preface; Part I Feudalism: Afterthoughts on Fiefs and Vassals; Carolingian elopements as a sidelight on counts and vassals; Fiefs and vassals in 12th-century Jerusalem: a view from the West; Fiefs and vassals in Scotland: a view from outside; Did all the land belong to the king? ; The use of feudalism in comparative history. Part II Law: Medieval law; The emergence of professional law in the long 12th century. Part III States and Nations: Government and community; The historiography of the medieval state; Our forefathers? Tribes, peoples and nations in the age of migrations; How different was England? ; Trust in medieval society and politics; The idea of a nation as a political community; Empires: a problem of comparative history; Secular power and authority in the Middle Ages; Vocabularies for comparative and interdisciplinary history; Index. Susan Reynolds is an Honorary Fellow of the Institute of Historical Research, UK, and an Emeritus Fellow of Lady Margaret Hall, Oxford.